Expansion joints with hinges allow angular movement in a single plane with the pressure thrust forces being restrained from the bellow. Hinges prevent the bellows from axial deflection. A gimbal expansion joint contains two sets of hinges, which are connected to a central gimbal ring/box by four pins, thereby allowing angular rotation in any plane. The pair of hinges restrains the unit from transferring pressure thrust forces to any external equipment. 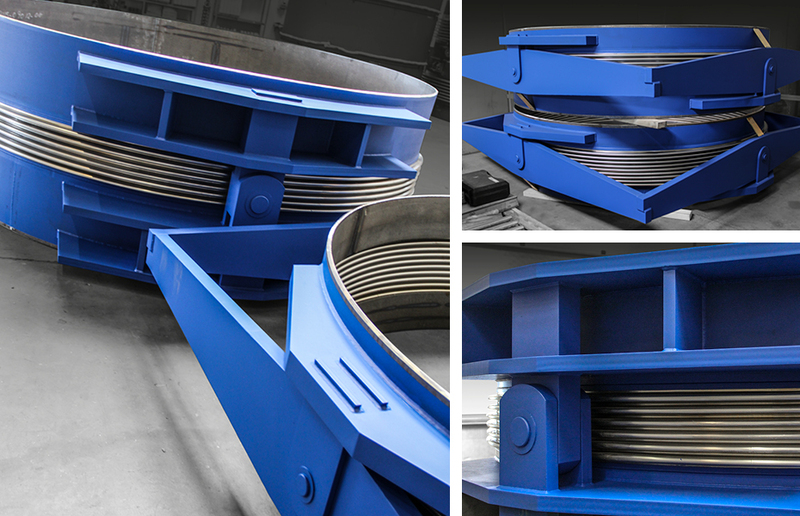 Gimbal expansion joints can be installed in sets to absorb large movements. The exhaust steam pipeline, in which these large units are installed, is designed in a such a way that movements are most efficiently absorbed as angular rotation of the bellows. The optimal expansion joint solution for such requires the use of both hinged and gimbal expansion joints. Designing expansion joints with hinges and gimbals gives many advantages; the system of gimbal ring, pins and hinges allows the gimbal expansion joint to rotate in several directions, with the hinge plates allowing the hinged expansion joint to rotate in one plane. This delivers greater flexibility in both design and usage. The hinges and gimbals simultaneously ensure control of absorbed movements while restraining the pressure thrust and extraneous forces on the bellow. By using this combination of hinged and gimbal units the power plant benefited from a solution which maintained the stability of the pipeline with minimal guiding being required. The positive result being the significant reduction in cost of the system fix points. When designing expansion joints with hinges and gimbals it is important to be aware of any surrounding external hardware or pipes. This is due to the hinges and gimbals requirement for sufficient installation space and also movement clearance when in operation. Belman is experienced in the design and manufacture of large dimensions in a wide range of types and materials. Such dimensions are customised designs, with dimensions over DN 6000 being supplied in unassembled segments which are later welding together onsite. This makes the process of transport and logistics much simpler. The customers can choose to perform the welding themselves or request Belman to undertake the onsite welding. Our service team has a vast experience in welding and is always ready to assist.